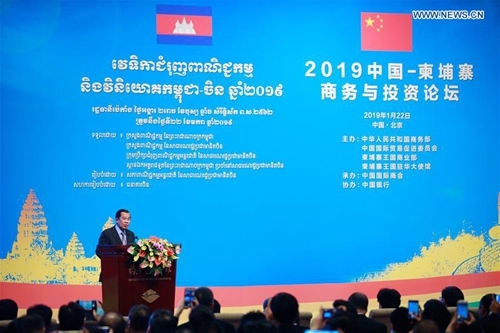 The China-Cambodia Trade and Investment Promotion Forum 2019 was held in Beijing Tuesday, aimed at exploring ways to boost economic, trade and investment ties between the two countries. 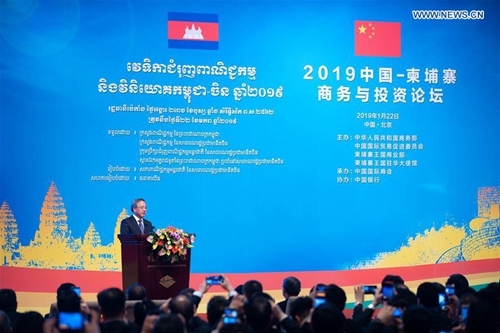 Chinese Vice Premier Hu Chunhua and Cambodian Prime Minister Samdech Techo Hun Sen addressed the event's opening ceremony. In recent years, with the concerted efforts of both sides, bilateral trade grew rapidly, achieving the goal of 6 billion U.S. dollars two years ahead of schedule, Hu said.